EPW058340 ENGLAND (1938). The Ducon Condenser Works and the surrounding residential and industrial area, North Acton, 1938. This image has been produced from a damaged negative. 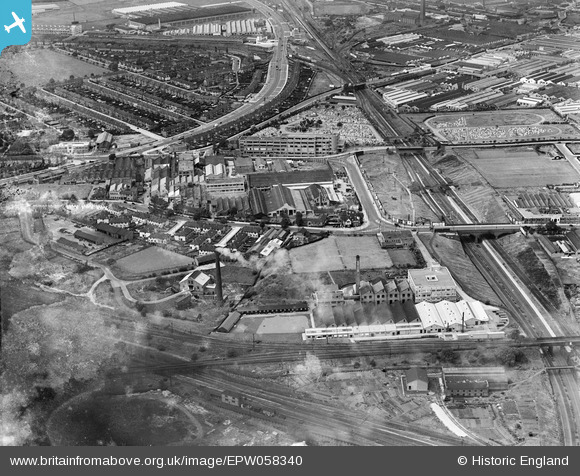 Title [EPW058340] The Ducon Condenser Works and the surrounding residential and industrial area, North Acton, 1938. This image has been produced from a damaged negative. Between the Cental Line Platforms and the higher level GWR platforms is the GWR's "Ealing and Shepherds Bush" Railway, these closed in the mid 1960s. The Great Western Railway's 1904 platforms at North Acton. They will close in 1947 along with Old Oak Lane, Park Royal West, Brentham, Perivale and Northolt when the Central Line tube is extended towards Greenford and West Ruislip. For Some reason the platforms at Ruislip Gardens stayed open until 1958, although these were also served by the ex-LNER Marylebone route. Is this remnants of Wales Farm? The Castle public house. Now a Fullers pub. The site of the Elizabeth Arden Factory and offices built either side of WW2. The building is now called 'The Perfume Factory' in honour of Elizabeth Arden, and house many buisnesses, one of which is 'Best of British Magazine'.